On April 14th, 1999, Manchester United and Arsenal played against each other for a place in the final of the Football Association Challenge (FA) Cup. While 30,233 fans watched, Manchester United took the lead in the 17th minute through David Beckham (1-0). 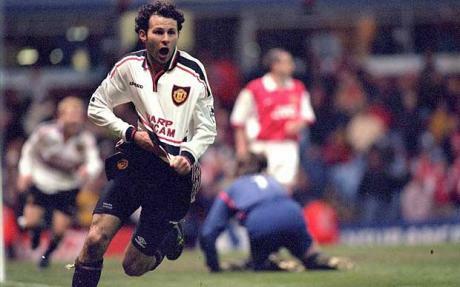 At the start of the second half, Man U’s Welsh wizard Ryan Giggs came on to replace Jesper Blomqvist. After 69 minutes, Dennis Bergkamp put Arsenal level (1-1). Later in the game, Roy Keane got a red card and sent off for a foul on Arsenal’s Marc Overmars. In injury time Arsenal was awarded a penalty kick, but Dennis Bergkamp’s shot was saved by Peter Schmeichel. Still level after 90 minutes and allowance for stoppages, the match went into extra time. In the 110th minute — in the second half of extra time — Giggs intercepted the ball from a pass by Patrick Viera at half field. He went on to skip past four Arsenal defenders before shooting the ball past David Seaman and into the goal. It would go down in history as a phenomenal play, a moment of sublime beauty. Taha Belal is an artist living and working in San Francisco.